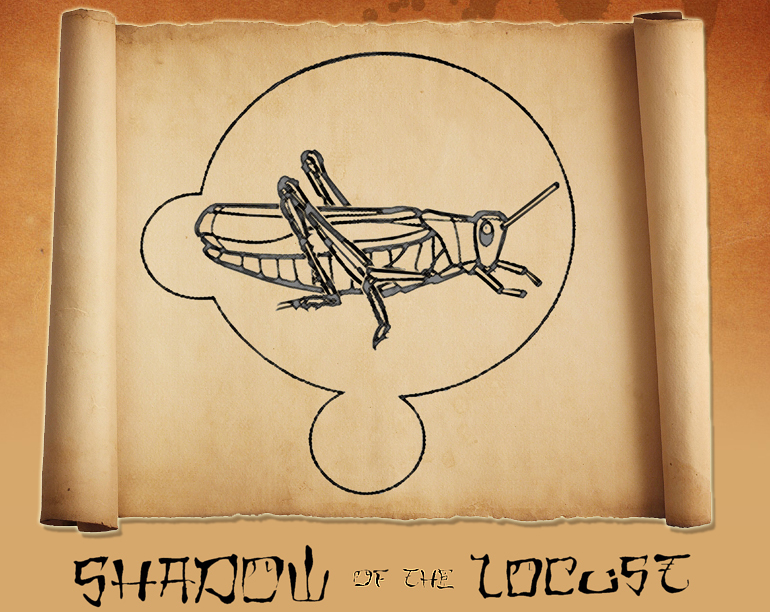 Why the Name 'Shadow of the Locust'? Of old nor ever will be in ages to come. Eden, behind them a desert waste-nothing escapes them. Like a mighty army drawn for battle. 9) They rush upon the city; they run along the wall. The thing that struck me the most about these passages of scripture was the vivid, detailed way in which the author, Joel, described this mighty army, which in reality, consisted of soldiers that were just simple insects. That’s right, just a bunch of a bugs! We know very little of the prophet Joel, apart from his fathers’ name (Joel 1:1). We can see that Joel was obviously familiar with themes that occur in Isaiah, Amos, And Ezekiel-particularly “The day of the Lord” (the day when God will finally judge the world and His own people). Even in our own century-Jerusalem has been stripped of all vegetation by plagues of locust similar to the one in these verses written nearly 800 years before the birth of Christ (the exact time and date of Joel can only be estimated). 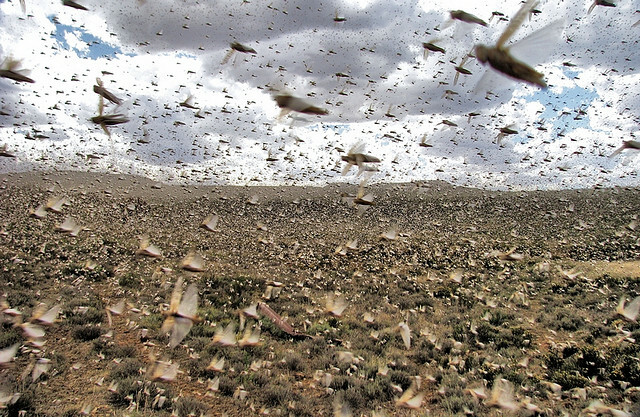 The swarm of several million insects is carried into Palestine by the desert wind from Arabia. 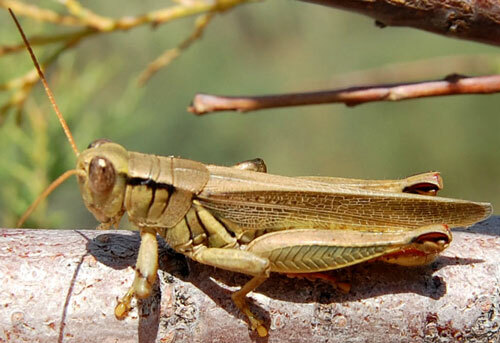 The locust grows rapidly from larva to winged adult (Joel 1:4), and at every stage its appetite is insatiable. This swarm is worse than an invading army because when it moves on there is no green or growing thing left (Joel 1:6-12). There is nothing to offer God (Joel 1:9,13). If any wheat or grain is left, it’s all that the city has to ward off starvation. Dead or dying insects taint even the water supply by falling into the wells and streams. For Joel, the locust swarm is an object lesson, a warning of the terror of God’s approaching day of judgment (Joel 1:15). The locust-army becomes a picture of the invading army of God on this day. The ‘scorched earth’ in their wake (Joel 2:3); their inexorable, totally unstoppable onward march (Joel 2:4-9). This is what God’s judgment will be like. Who can bear it (Joel 2:11)? But no one needs to endure God’s wrath. He is still calling people to repent (Joel 2:12). Joel calls the whole nation to turn to God and plead for mercy (Joel 2:13-17). And in response, God promises to restore everything (Joel 2:19). We, as human beings, are nothing. We are very weak on the larger scale of things. Our bodies, like the locust, can be very easily crushed. But, also like the locust, when we team (or swarm) together we become very powerful. When we unite for a common cause our efforts are multiplied and our weaknesses decrease. Remember that when Joel speaks of these ‘charging warriors’ that ‘break through defenses’, he’s speaking about a bug that only grows to nearly 2 inches long. The key word is: army. The key thought is: the united effect of an army. There is no such thing as a one-man army. In fact, Webster’s Dictionary defines the word as: (noun; plural) a large body of people organized for warfare. What if only one locust was sent to ‘swarm’ through the city? 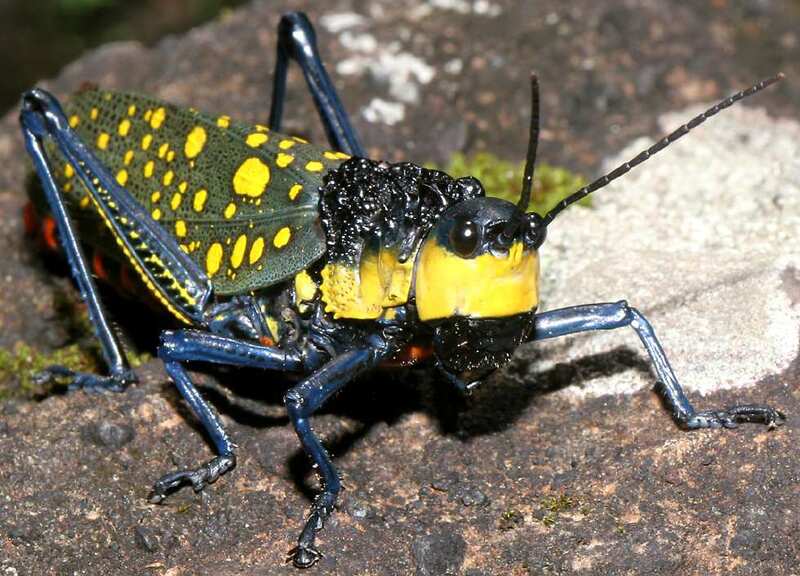 That locust would’ve, most likely, gone unnoticed, maybe even ending up swatted and crushed by some farmer’s hand. So the locust’ power does not come in their physical size or even in their destructive appetite, but in their unity (and more importantly, in who united them). Oneness is mandatory for the effectiveness of any army. And Joel is, by far, not the only place in scripture that teaches us of unity and it’s importance. Rom.12: 5,"So in Christ, we who are many form one body, and each member belongs to all others. Gal. 3:28,"There is neither Jew nor Greek, slave nor free, male nor female, for you are all one in Christ Jesus. Ph. 1:27,"Whatever happens, conduct yourselves worthy of the Gospel of Christ. Then, whether I come and see you or only hear about you in my absence, I will know that you stand firm in one spirit, contending as one man for the faith of the Gospel. 2 Cor. 13:11,"Finally, brothers, good-bye. Aim for perfection, listen to my appeal, be of one mind, and live in peace. And the God of love and peace will be with you. Also: 1 Cor. 1:10, Eph.4:3, 1 Pet. 1:8, Matt.18:19 and many more. So togetherness, amongst the believers of Christ, cannot be expressed enough. Unity is not only a necessity, it also pleases God. And when the locust, of Joel chapter 2, ‘plunge through’ worldly defenses, they are exemplifying this important message of unity. A very critical lesson can be obtained from verse 7. The locust did not swerve from their course which means that they stayed focused. Obviously, a focused person is a person who puts forth his or her best effort while performing a task and does not lose sight of the task. And our task, as believers, is of the highest order. Jesus gave us the great commission by saying,"Go ye into all the world and preach the good news to every creature. "-Mark 16:15 . By this, the Lord commands us to set up His kingdom among men by preaching the Gospel (good news). This is why God calls us to evangelize. Our goal is not to convert souls, seeing as how we do not have the power or authority to do so. That's God's part. Our part in evangelism is to simply glorify God by obeying His command, and to deliver the message as truthfully possible (not deviating from the word of God). With this in mind, being focused is very important. When we lose focus, we fail to accomplish the goal. Our, attention as believers, is attacked constantly by the deceptions of the world's thought system, the devil, and our own tendency to be sinful creatures. This is why being alert and focused is necessary for us to obtain the upper hand in our faith. Even scripture says,"So then, let us not be like others, who are asleep, but let us be alert [focused ] and self controlled"(1 Thess.5:6). Also 1Peter 5:8 says,"Be self controlled and alert [focused ]. Your enemy, the devil, prowls around like a roaring lion looking for someone to devour." SO, BE FOCUSED LIKE LOCUST! As said before, Joel wrote to us of a great plague of locust that struck Judah. During this destructive onslaught, the prophet then calls for the people of the land to repent of their iniquities,"'Even now', declares the Lord,' return to me with all your heart. '"-Joel 2:12. Now realize that we are not to seek putting anyone in anguish, but as witnesses to the message of the cross and it's redemption, we are coming against the unsaved. Our messages are totally different. We preach subservience to Christ while they preach subservience to self gratification. Our foundational beliefs clash. And as we walk with Jesus, in our faith, we bring anguish to the those who do not share the same belief as us. It's through this anguish that they might come to terms with their need for salvation and repent, and therefore receiving the joy that all Gods' people possess. The locust (as do we, the disciples of Christ) brought with them, the conviction of the Holy-Spirit, and thus anguished the enemies of God. Those who lived life according to their own ways had to stop in their tracks and face the reality of the decision being brought to their attention:Repent or be lost. This was a crucial and severely anguishing time for those who did not live under God's authority(and if you are under God's authority now, then you can relate to the anguish that these people were feeling. We've all been at that cross section in life). There was a battle going on, in spiritual realms, that was emotionally draining and this brought forth the distressing anguish. But if you were on the 'locust' side of the fence, then you would not be feeling this same suffering, for you would be working for the 'Prince of peace' (Isa.9:6). The locust did not seek to bring torment to anyone, but through their odediance to the will of God, the message they brought with them agonized those living wickedly. At the same time, hopefully without sounding harsh (to the 'tormented' team) , it's probably safe to realize that when you are working for a team and the other side is in anguish, then you must be on the right track. Why is it that there is so much division in the body of Christ? The apostle Paul wrote,"I appeal to you, brother's, in the name of our Lord Jesus Christ, that all of you agree with one another so that there may be no divisions among you and that you may be perfectly united in mind and thought."-1Cor. 1:10. It seems as if we did not heed this message. We have our Baptist, our Southern Baptist, our Pentecostals, our Episcopalians, our 7th day Adventist and many, many more. In fact, the book,"Life in the Father's house" by Wayne A. Mack estimates the number of denominations throughout the world at a staggering 20,800. If Joels' locust were human it would seem as if they would not have let personal opinions get in the way of fulfilling their goal. And the goal (as stated before) for us, is to glorify God. Once again, the Apostle Paul wrote to us concerning this situation. Romans 14:14-17, says (concerning things that are clean or unclean),"As one who is in the Lord Jesus, I am fully convinced that no food is unclean in itself. But if anyone regards something as unclean, then for him it is unclean. If your brother is distressed because of what you eat, you are no longer acting in love. Do not by your eating destroy your brother for whom Christ died. Do not allow what you consider good to be spoken of as evil. For the kingdom of God is not a matter of eating or drinking, but of righteousness, peace and joy in the Holy-Spirit, because anyone who serves Christ in this way is pleasing to God and approved by men.Let us therefore make every effort to do what leads to peace and mutual edification." Paul was basically saying to not 'jostle' each other with idle arguments. Now it's a given, because of our variety of backgrounds and sources of knowledge, that we may have theological and/or moral disagreements. But if we use the same mind, that we are disagreeing with, to fervently study scripture, then we might come up with Gods' answers to these debates(instead of our own). What's the answer to solve this problem of having a lack of oneness between believers. It would seem that if God could get a bunch of insects together to do his will. Then why not, if we would submit to the unifying power of the Holy-Spirit, a bunch of us human believers.---Hmmmmm! To be a thief, you have to gain access. And to gain access, you have to be sly. Jesus said,"I am sending you out like sheep amongst wolves. Therefore be as wise as snakes and as innocent as doves."-Matt. 10:16. The Lord was not speaking of a compromise (nor am I). There is a level where you can be as 'wise' as the snakes in this world, and still remain 'innocent' of sinning against God. It's called; 'Using your creative thought process'. It's such an awesomely wonderful thing God gave us when he created our minds. If we write a poem, paint a picture, or just simply glue together a special card for someone, we get a small glimpse of what it's like to create (the difference is God can create things out of nothing where as we cannot). We, as believers, are not a bunch of yo-yo's. Just look around and see how creative our Father God is. He made everything from the smallest molecules and atoms, to the planets and universes (not to mention all the scientific laws that fall within our planets and universes) His crayola box has colors that you would never imagine possible. He assembled creatures that swim, that walk on land, that 'walk' beneath the land, that fly, that climb. He even made fish that can fly and birds that can swim. I mean, the Guy even came up with the duck-billed platypus. He's a creative genius!!!! He's the all-knowing, all-creative Father God whom we profess to have full faith in. The exciting thing is that he gave us the capability to create also(of course on a much smaller scale) . He instilled, within us, the competence to learn and grow with knowledge. He made it so that we can grasp concepts and meditate on them. He granted us the capacity to creatively work our way through the obstacles that arise against us (whether in our ministries or through the struggles of life in general). And, even better than all of that put together, He gave us the extraordinary gift of being able to communicate with his Holy-Spirit which can guide us into the truth of all matters (It's his job!-," [Jesus speaking ] 'But when he, the Spirit of truth, comes, He will guide you into all truth. He will not speak on his own; He will speak only what he hears, and he will tell you what is yet to come'"-Jn.16:13) . By developing and using the abilities that God has granted us, we can become like the locust that are able to gain access into the dwelling places of the iniquitous, as if we were thieves. But instead of stealing material possessions, we could rob them of their message of hopelessness and replace it with 'seeds of the living word of God', in the hopes that the truth may be revealed to them (Hey, thieves don't usually steal something only to replace it with something better. But we are a different breed of thieves). Locust armed (with the armor of God) robbers. 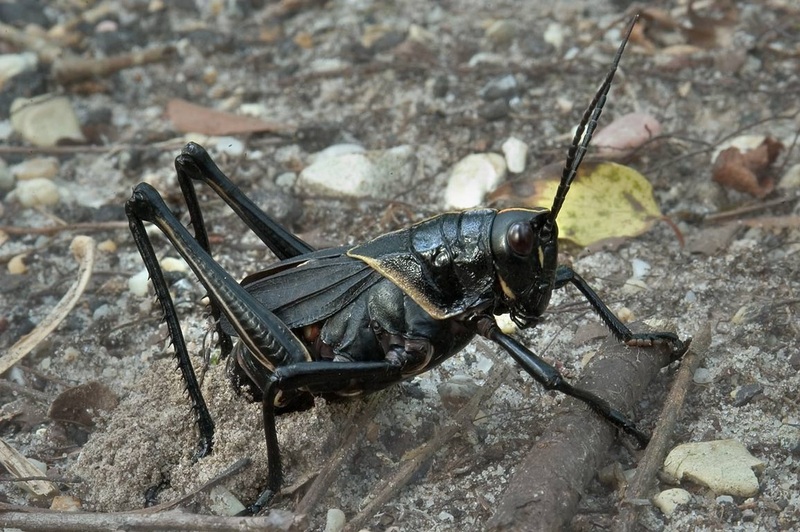 We've drawn some clever lessons from the examples of Joels' locust. We've gone over things that we can take from Gods' 'insect army' and discussed how we can apply them to ourselves (Gods' human army) . But the most important thing to be learned from this insect army is about who their commanding officer was. 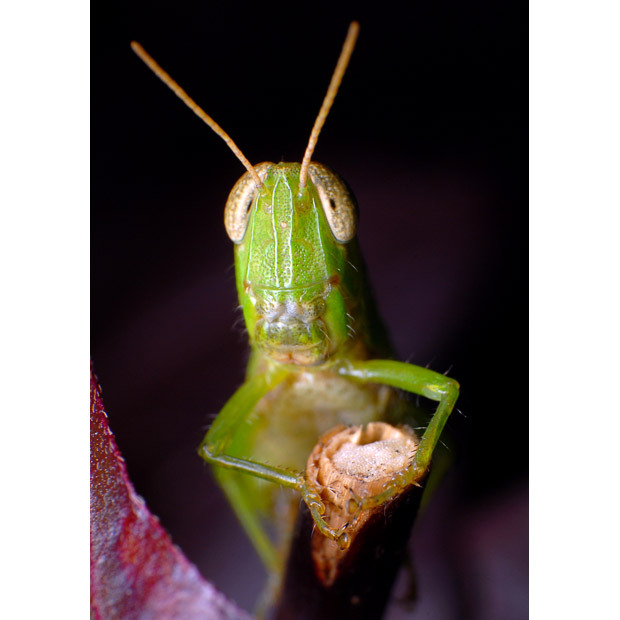 Joel 2:8 tells us that the locust plunged through defenses. And how did these small creatures do this? Simply, because they were sent from God to complete His will. Who can stand against the will of God!? Who can thwart the plans of the King of kings!? No one (Job 42:2). The worlds' top strategic defenses (spiritual and physical) are like wet paper against the decree's of the Almighty Father of heaven and earth. That's the most awesome thing about belonging to Gods' army (insect or human) . We've already won! The battle belongs to the Lord (1 Sam. 17:47). And 'the Lord thunders at the head of His army. The locust were strong. But definitely not because of their size, more so because of their unity, and even more so because of who united them: The Almighty-Gen.17:1, Eternal-Dt.33:27, Fortress-2 Sam.22:2, and Heavenly-Matt.6:26, Holy-Ps71:22, Judge-Gen18:25, and Living-Jos3:10, Most High-Dt.32:8, Strength-Ex.15:2 and Righteous Father God who reigns supreme with an authority that cannot be shattered. How many area's of your life can you say that you let God 'thunder at the head of'? 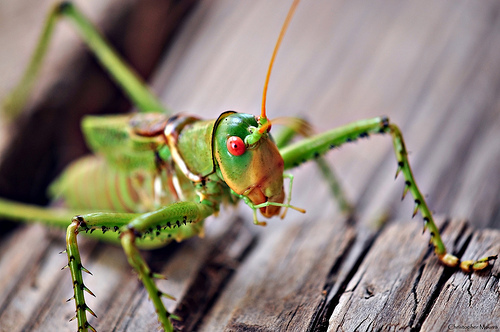 The locust were 'mighty' because they obeyed the commands of the Lord. For us (and our ministering/evangelism) to be mighty, our personal walk with God has to be a disciplined and obedient one. We must adhere to the will of God as given to us through his word (the bible) and we must not be afraid to submit to the promptings of God's Holy-Spirit. A friend of mine once gave me a piece of paper, that he had written on, saying," Do not seek to build an awesome ministry. But seek, rather, to build a disciplined lifestyle." 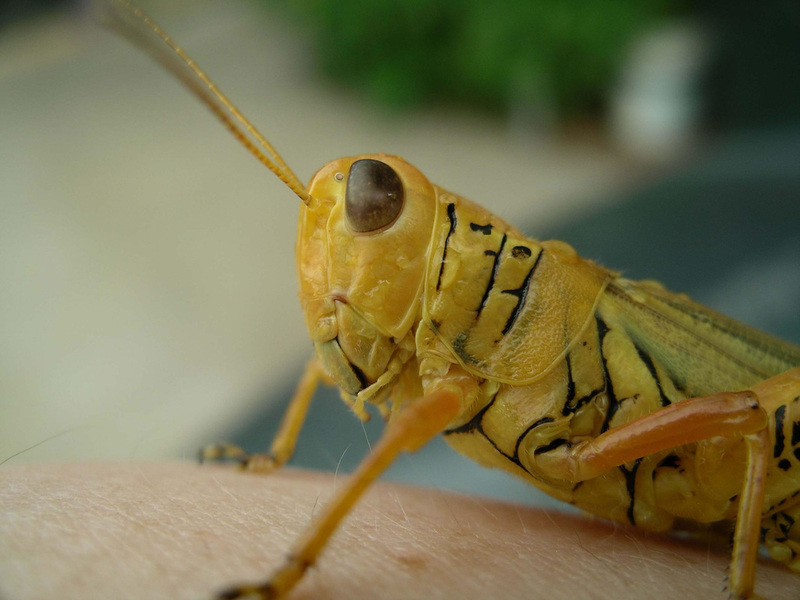 Realize that if we focus (like locust) we will be able to discern the will of God. And as we move within the precepts and authority of Christ, we too, will be like a mighty army that crushes the influences of the devil and his declaration of self intoxicating sin. Matthew Henry wrote this, in his commentary, about the 2nd chapter of Joel,"Thus the beginning of this chapter is made terrible with the tokens of God's wrath, but the latter end of it made comfortable with the assurance of His favor, and it is in the way of repentance that this blessed change is made; so that, though it is only the last paragraph of the chapter that points directly at gospel [good ] times, yet the whole may be improved as a type and figure, representing the curses of God's law invading men for their sins, and the comforts of the Gospel flowing into them upon their repentance." It is because of this , and all these things discussed in the sections above, that the name 'Shadow of the Locust' was thought up and given to a group of God-fearing people called into Hip-Hops' music industry. The "shadow" represents the shade cast upon the ground when God's oncoming forces swarm towards the cities of the unrighteous. The "locust" represents the soldiers found within this army. Military men and women willing to unify their efforts while focusing their attention on the infallible word of God. Warrior's who bring anguish to God's enemies. Regiments of upright families,tribes, and communities that do not jostle each other with idle arguments. Battalions upon battalions of armored militia, serving and obeying the commands of the Lord. When we say 'Locust' we are saying 'saint(s)'. The message? It's this: When God's army comes swarming through your town, and the Lord almighty is calling you to repent and turn from your evil ways. You can either deny his call to salvation and be left in devastated solitude. Or you can enlist yourself in to the sovereign army of the Most High Father of creation (where you get a pair of spiritual antennas to communicate with the chief commander himself).